There are many situations that put the keys to your home or business into the wrong hands. 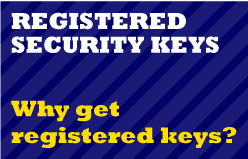 It is easy for criminals to duplicate your keys as most standard keys can be readily copied. All that is required is to take them to your local key-cutter or hardware store. Remember the last time you had keys made? Were you asked for any identification or authorisation before the keys were cut? The result can be unauthorized access to your home or business! Many home and business owners hand over keys to employees and tradesmen, who could potentially copy them. Changing your locks does not solve the problem, because you are likely to have to do so again and again. If you can't control who can copy your keys, you can't control your security. 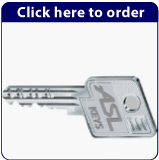 At ASL Locksmiths we can offer an advanced level of positive key control for your home or business. We will maintain records of your key system and authorization is checked prior to any keys being duplicated for our High Security key bearing clients. 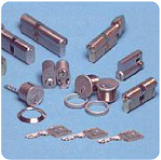 Once we have supplied and fitted one of our locks to your premises, we can register your signature if required. You can then obtain copies of your key by faxing, posting or emailing an order to us containing the original signature. Your additional keys will be dispatched to you by recorded delivery, normally within 5 working days. The keys feature a double profile system giving 32 billion locking possibilities. Keys are exclusively available from ourselves. If you need duplicate keys now, please place an order by clicking here and if we need to contact you about authorisation, we will do so. Our unique key systems make it virtually impossible for anyone to duplicate your keys without your knowledge while at the same time providing your home or business with physical protection from picking or drilling, as the high security cylinders we provide are very highly pick and drill resistant. We can also use these registered keys as the basis of a "Master Key System" enabling you to control employee access to different rooms, enabling various persons with different access authorizations to open all relevant doors with only one key.